Summertime! Time to leave our urban jungles and go on a well-deserved holiday or visit friends or family. You packed your sunglasses, beach towel and a few books? 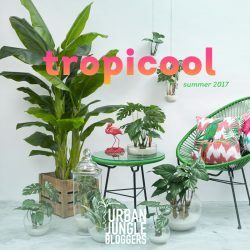 Then it’s time to prepare your urban jungle for a few days or weeks without your care. 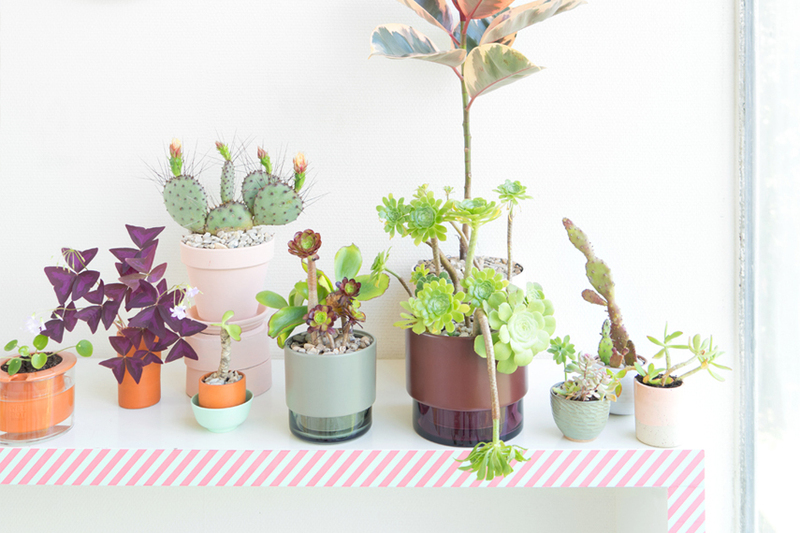 Don’t stress, we have some tips so that your houseplants will survive your holiday! • Find a plant sitter. Ideally, ask someone you trust to take care of your plants. Maybe a neighbour or friend can come visit once a week and give your plants some water and fresh air by opening the windows? Make it easier for him/her by providing some information about how much water your plants need and other specific plant care instructions. Be creative: you can use little flags or stickers to mark plants that need a lot of water, or plants that need extra fertiliser or misting. Even easier: Just make a little video with your smartphone and send it to your plant sitting friend! Also explain what “a lot of water” or “very little water” means: is it one cup per week, or an entire watering can per plant? • Make sure your plants are healthy. Some plants may need some fresh potting soil or some air in the potting soil (by making small holes into the soil with thin stick, so that water can run through it). Also check your plants for bugs or illnesses. Treat accordingly before you leave. Or place the infested plants in quarantine. • Group your plants. This makes watering easier for your plant sitter and slightly increases the air humidity if you decide to go for a self-watering option. 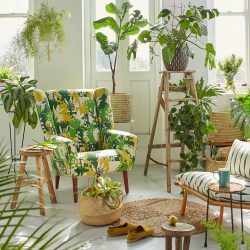 And bonus points: a #plantgang looks very stylish too! • Some plants don’t like to be moved, like Ficus plants, so don’t move them just for your holiday. If you really want it to be grouped with your other houseplants, move it gradually during the weeks before your holiday. • Plants need light and water to stay alive, even more so in the summer when they’re growing. So don’t place your plants in a dark room with the shutters closed! Prefer a fresh room with medium light, without direct sunlight to avoid sunburn. • Remember: more plants die of overwatering than not enough water, so placing them in a bathtub filled with water is not always ideal! • Waterworks is a natural hydration system, consisting of a partially glazed terracotta cone and a glass bulb with a cork stopper. • Bjorka Design WET POT uses the same idea of glazed and unglazed terracotta and glass as the Waterworks bulb above. The terracotta plant pot basically bathes in the glass water container and soaks up water according to its needs. We love using it for water-loving plants like Pilea peperomioides. Works like a charm! 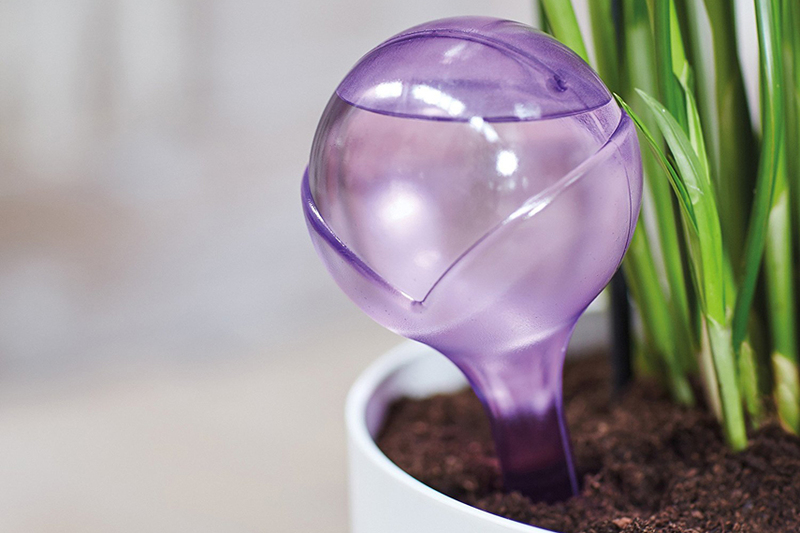 • Parrot FlowerPower is a Y-shaped connected device that keeps track of water, sunlight and fertiliser and uses Bluetooth to send you information on your smartphone. 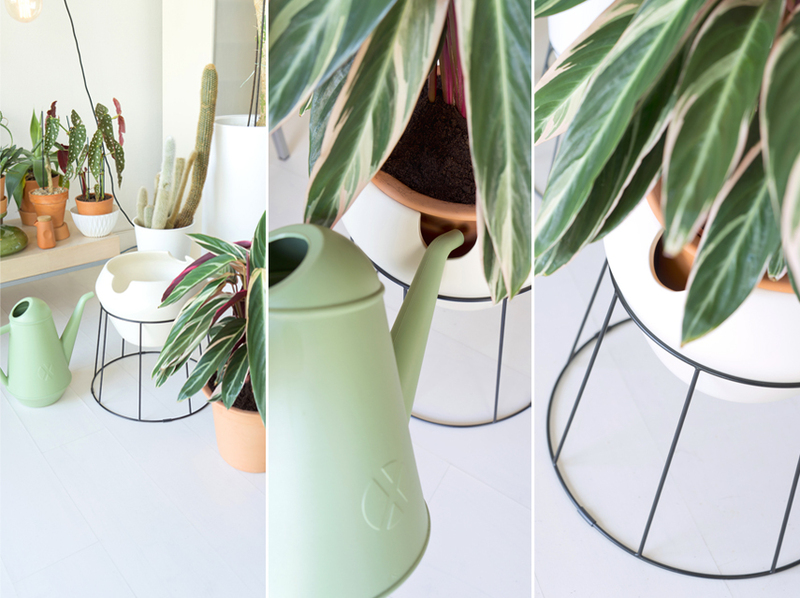 Parrot also launched a self watering plant pot earlier this year, called the Parrot Pot which integrates this technology directly into the plant pot. • Shoelace method: All you need for this is a glass, mug or any other vessel filled up with water and an old shoe lace. Fill the glass with water, place one end of the lace into the glass and the other end in the soil of your plant. 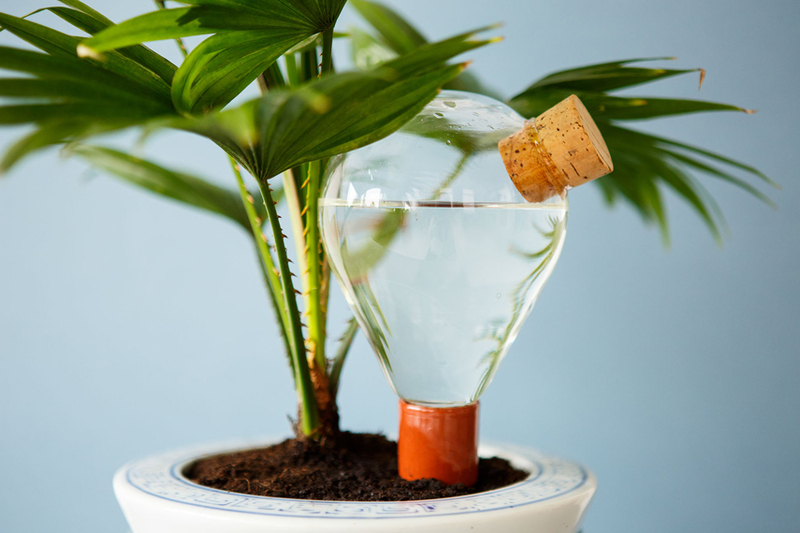 The shoe lace transports the water slowly from the vessel to the plant pot and secures a constant hydration without overwatering your plant. Perfect and easy! 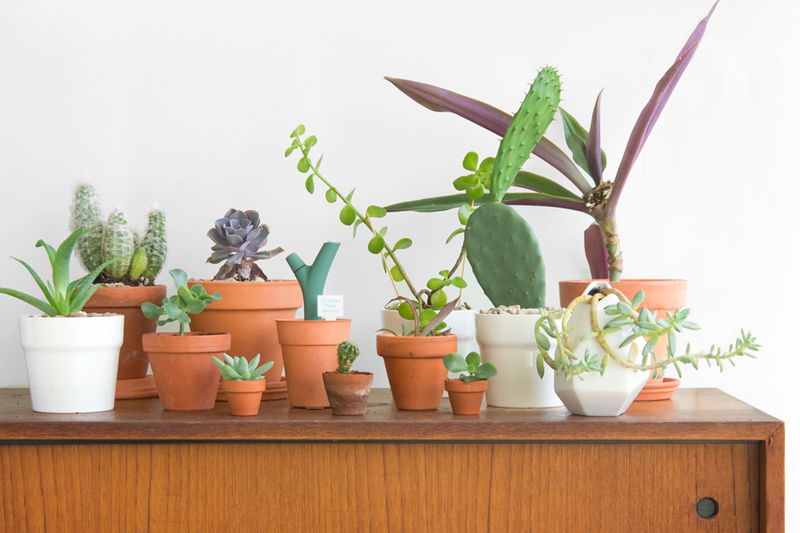 A simple method for smaller houseplants. • Lucie Kaas GRO pots are both stylish and practical. The plant pot is made of heavy ceramics in three different colourways: laurel oak, gun metal and red mahagony, and are placed on a mouth blown glass bowl in the same colour. The ceramic pot is unglazed at the bottom and has small holes which allow to soak up the water from the bowl and provide for the plant at all times. • Elho Aqua Care is a very simple and easy tool to water your plants. Simply fill the water reservoir and plant it in the pot to give the plants the correct level of water required. • IKEA PS selfwatering plant pot set. It’s a big plant pot that works really well for larger plants that require water regularly like Calathea plants, Marante or palms. You simply fill the large white pot with water before you leave on holiday and it will be enough for at least a few weeks. The terracotta pot inside will soak up the water and keep your plant happy and a live. It comes with a large plant stand that adds some height to your plant. • Water retaining gel, plant water crystals, or Hydro gel. This is a not an organic method, as the crystals contain polymers, so it’s not a method we use very often. The gel or crystals contain up to 3 weeks worth of water. You simply pose them on the soil, or mix them with the upper layer of the soil if you don’t like how jelly they look. They absorb and release water throughout your holiday. We advise to test this before you go on holiday, so that you find out the exact amount of gel that your plants need. 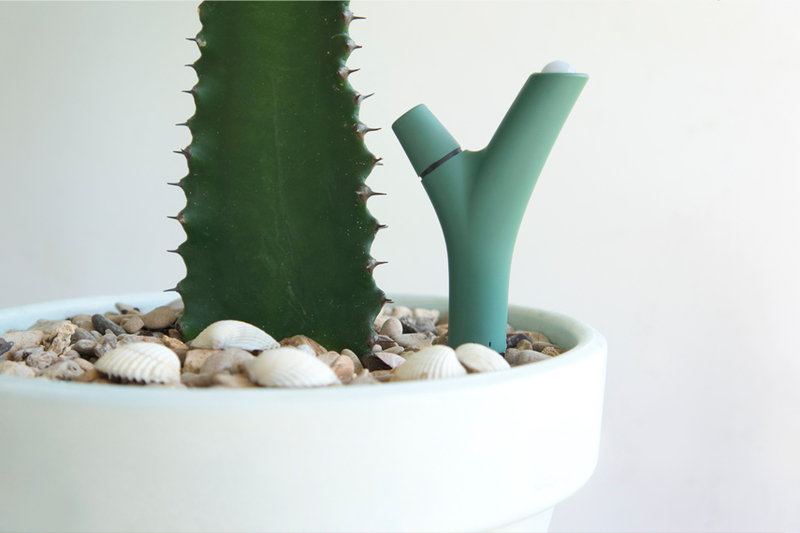 • The Lander Planter, just launched on Kickstarter. 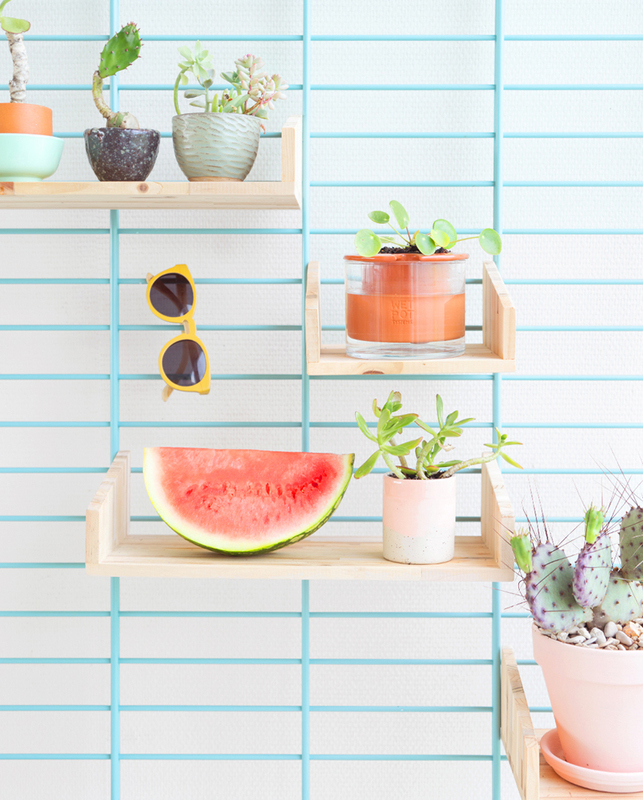 It’s a stylish self-watering plant pot with a mid-century vibe with its plant stand in walnut or maple. Support this project by purchasing your Lander Planter now and you’ll be fine for the next holiday. Now head off towards the horizon and enjoy your holiday! Your plants will live! Please note this is NOT a sponsored post, we genuinely like and use the products featured in this post.